In late 2013, approximately 40 million customer debit and credit cards were leaked in a data breach at Target. This catastrophic event, deemed one of the biggest data breaches ever, clearly showed that many companies need to significantly improve their information security strategies. 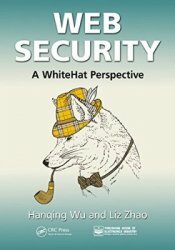 Web Security: A White Hat Perspective presents a comprehensive guide to web security technology and explains how companies can build a highly effective and sustainable security system. In this book, web security expert Wu Hanqing reveals how hackers work and explains why companies of different scale require different security methodologies. With in-depth analysis of the reasons behind the choices, the book covers client script security, server applications security, and Internet company security operations. It also includes coverage of browser security, cross sites script attacks, click jacking, HTML5/PHP security, injection attacks, authentication, session management, access control, web frame security, DDOS, leaks, Internet transactions security, and the security development lifecycle.